Barbara Joel was born in Southern California, U.S.A.. The youngest of fivechildren, she discovered early the peaceful satisfaction of daydreams andreading a good book. Now, married with two children, she also enjoysspending free time in her garden and relaxing with family and friends. Barbara used a typewriter to write her first manuscript, she hadn't acomputer. She says "I'd never heard of an Internet!" 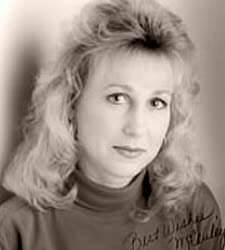 Her book "Woman Tamer"came out in 1991 under the name Barbara McCauley. Since then, Barbara haswritten 17 Silhoutte Desires and one Silhouette Sensation. She has also beennominated for numerous awards and her books regularly appear on bestsellerlists. In addition to her family and a busy writing schedule, she has alsofound time to serve as co-president of Orange County Chapter of RomanceWriters of America.